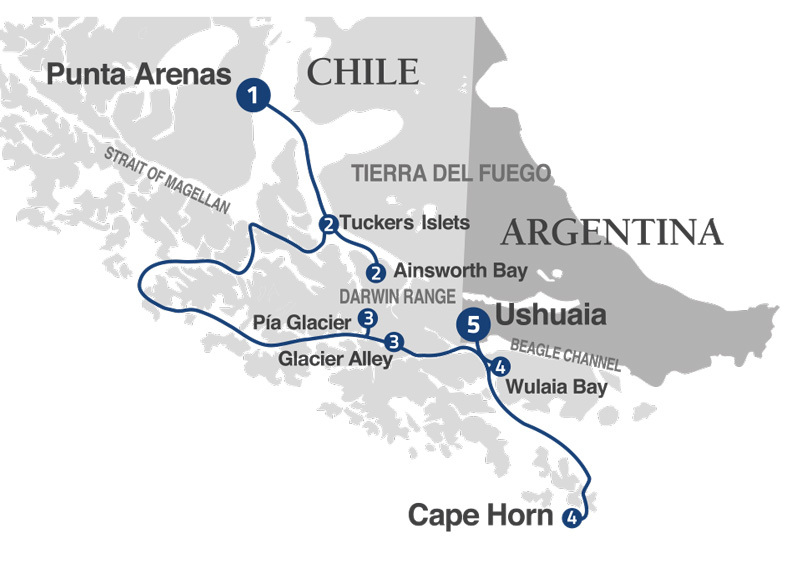 The Route Darwin in the new ship M/V Ventus Australis, from Ushuaia until Punta Arenas and returning to Ushuaia. Darwin's Route from Ushuaia: Departing from Ushuaia, retrace the route of Charles Darwin aboard HMS Beagle on an expedition cruise through the secluded Fuegian Archipelago at the bottom of South America. Our adventurous nine-day (eight-night) itinerary includes legendary Cape Horn and historic Wulaia Bay, as well as Glacier Alley, the penguin boisterous colonies on Tuckers and Magdalena islands, as well as the spectacular fjords that harbor Pía and Águila glaciers. While visiting Patagonia you'll also encounter massive ice fields, lush sub-polar forests and secluded beaches on islands that remain refreshingly remote and barely touched by civilization, a rare glimpse of what planet Earth must have been like before mankind. Midway through the journey, a half-day port call in Punta Arenas leaves plenty of time to explore a city rich in history, architecture and Patagonian culture before resuming the journey back to Ushuaia. In the morning, we will enter Garibaldi fjord, once we will disembark to trek through the Southern Patagonian forest, we will climb to the base of a waterfall of the glacial era. Those who decide not to walk to the Garibaldi Glacier, will navigate to it as close as possible to appreciate the glacier from very near. 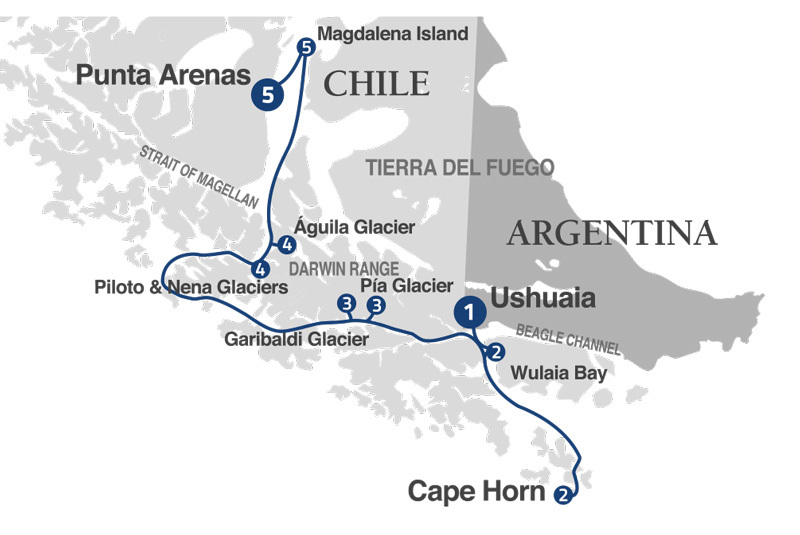 During our second journey, the route card in the Australis cruise will guide us to navigate through the main arteria of the Beagle Channel, we will get into by the northwest side of the Pia Bay channel, so then we can make a descent in the glacier which has the same name. This snowdrift introduces in the Darwin mountain chain and it drains by the Waters of its bay. In our next navigation day, we will go to the desert inlets of the Brecknock, Ocasion and Cockburn chanels, so we can arrive to our first destination: Seno Chico. The Brecknock passage is a short lenght chanel, but there are waves and runnings to take into account among its many islands. We will leave this route so we can get into the Cockburn Passage and keep safe from the big waves produced in the chanel. We will finally get to Seno Chico so we can disembark in zodiac boats through the Alakaluf Fjord. This Fjord was named in honor to the ancient groups of nomad canoeros, who could made the Alakaluf ethnic Group in the last hundred years, also known as the Kaweskars. These fishermen and sea hunters lived in the archipelagos, fjords and chanels surrounded by the Gulf of Penas and Brecknock Peninsula. We will continue through beautiful waterfalls to Piloto and Nena glaciers, where we would be able to know more about the origin of the glaciers and their repercussion on the patagonic chanels region. One of the most memorable experiences will be the sound produced when we go through fragments of ice from the glaciers. We will continue our crossing to the Glacier Águila Bay, where we can do a light trekking along its marvelous Beach and then we can surround its lagoon to arrive to the glacier. We will start our next day of navigation on board of the Australis Cruise at dawn, now we are close to Seno Almirantazgo, a fjord which is located in the west coast of Tierra del Fuego. Between the important sea biodiversity and underwater we will be able to sight sea elephants and black - eyebrow albatrosses. Then, we will do the first descent in the Marinelli Glacier, Ainsworth Bay, the largest glacier among those which come from the Darwin Mountain Chain´s Ice Field. This giant of ice will surprise us with its ice walls about 40 metres high. This is the place where we will do some hiking so we can sight varied fauna and nature from the Magallanes woods: dams built by beavers and a great quantity of sea elephants which constrast with the amazing landscapes. Later on, we will go to Tucker small island, a certain point which delimits the northwest of the Whiteside Channel. The region has become now into a very valuable territory thanks to the natural nutrients which gave origin to the wonderful fauna that we will be able to watch. During our next journey, the route card in the Australis cruise will guide us to navigate through the main arteria of the Beagle Channel, we will get into by the northwest side of the Pia Bay chanel, so then we can make a descent in the glacier which has the same name. This snowdrift introduces in the Darwin mountain chain and it drains by the Waters of its bay. We will continue our crossing on the Australis to the northwest of the Beagle Chanel so we can gaze at the amazing "Glaciers Avenue" which is a narrow way in the Beagle Chanel where we will be able to watch many spectacular ice tongs that descend from the Darwin mountain chain to the sea. The name for this way was in honor to the glaciers which are particularly located one beside the other and very short distance between them to navigate. Those glaciers are: Germany, Italy, France, Spain, Netherlands and Romanche.